Lowrance is a highly respected, well-established brand. That fact alone is a reason to trust their products. Lowrance has been well-known for the quality of the electronics it has been producing since the 1950s when they sold the first transistorized high-frequency sonar adapted to sport fishing. This and subsequent products were incredibly popular, and there was huge demand; Lowrance sold a million fish finders over the next 25 years. Since then, Lowrance has continued this legacy by making products with continually improving performance and new capabilities. Lowrance leads the industry with its innovative new products employing the latest technology. 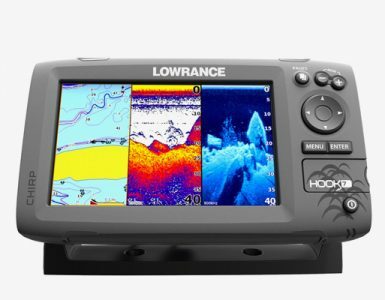 The Lowrance Mark-4 HDI is one such product, relatively new, affordable, portable, and extremely high-quality, just like Lowrance’s original “Little Green Box” fish finder when it first came out. Considering how much it can do, that is truly an incredible deal. 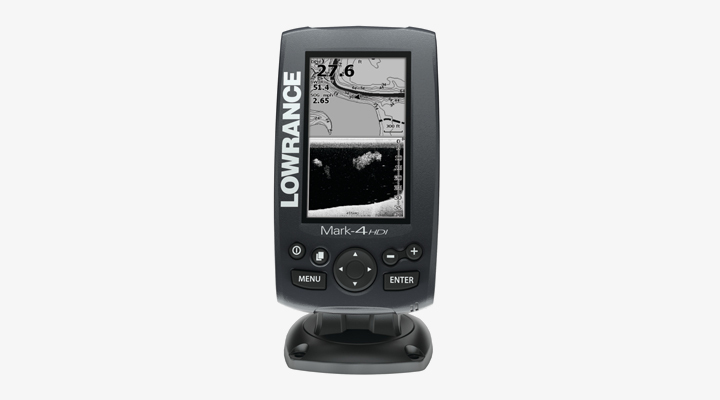 The Lowrance Mark 4 is easy to use; it has a very straightforward interface, with clear navigation controls and an equally clear, simple menu. Don’t worry, though–this ease of use does not come at the expense of a wide array of features. 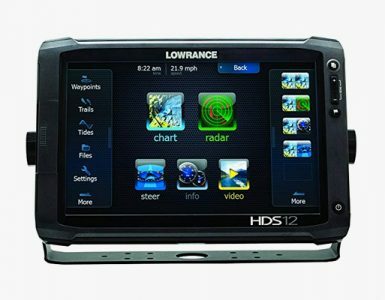 The Lowrance Mark 4 HDI uses Advanced Signal Processing, or ASP, to minimize the need to actually adjust the device’s settings yourself, manually; this really improves ease of use and is incredibly convenient. 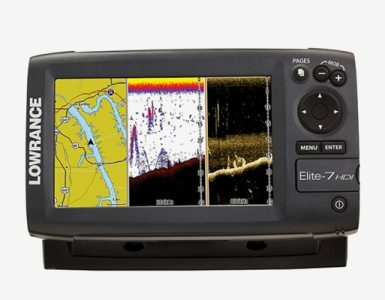 Its backlit, grayscale screen measures 4.3 inches, and employs LED technology, making it easy to see on even the brightest days (often an issue with other fish finders). It is very portable at 11 x 9 x 4 inches and only a little over four pounds–that is really light. In terms of portability, it does need a 12v battery, and the screen should be mounted for true convenience, so take those factors into account (although neither of those requirements are particularly inconvenient, in my opinion). It is also waterproof, which is, of course, completely necessary when you are spending your days with it out on the water! The Lowrance Mark 4 employs the latest technology, which is part of why the price is so impressively affordable. Among the most notable of these is its HDI. HDI stands for Hybrid Dual Imaging, which is a combination of Downscan Imaging and Broadband Sounder. This makes for a superbly detailed view. The Downscan Imaging technology is catered to clear views of underwater topography, including depth and underwater features. On the other hand, the Broadband Sounder capability allows you to see the size and trajectory of the fish you are tracking. The Downscan Imaging employs the 455/800 KHz transducer, while the Broadband Sounder is associated with the 5/200 KHz transducer. These transducers can reach way into the water; they are useful at depths of up to 2500 feet. Not bad at all. Not only does the Lowrance Mark 4 provide hyper-accurate readings, its GPS is also very advanced. Having a high-quality GPS is a feature integral to a good modern fish finder. Its Chartplotter capability uses a GPS antenna with highly accurate U.S. maps displaying 3000+ inland bodies of water. These U.S. maps also display coastal contours for up to 1000-foot depths. With an additional microSD card you have access to many more maps and charts as well. Furthermore, users can record their own sonar logs to make and upload their own maps to the Insight Genesis online custom map site. This means that the depth of knowledge is always being shared and expanded among fishermen using the Lowrance range of products. You can share with your friends, family, and perhaps even the competition for a bit of friendly intimidation with your impressive skill. By including social media capabilities in its products, Lowrance is truly leading the pack in bringing fishing into the digital age. Whatever your mapping needs, the Lowrance Mark 4 HDI is likely to be able to fulfill them. With all of this information in mind, I absolutely recommend the Lowrance Mark-4 HDI to those fishermen looking for a product with great portability, incredible value, ease of use, and a range of advanced and high-tech features, such as HDI and GPS. It adheres to all of these criteria, and more.